There is nothing more satisfying than picking up the rewards for something you went to great lengths to attain, and trainer Stephen Gray would know the feeling after newcomer Runfinnrun scored at his debut on Sunday. The Kiwi handler liked the way the son of Reliable Man breezed up at the New Zealand Ready-To-Run the year before, and when he was passed in, he spoke to Russell Warwick of Westbury Stud and Richard Otto, from the Ready-To-Run management. A few days later, he was told he could have the grey three-year-old as no deal had been found, and the price was NZ$140,000. Not cheap, but Gray shelled out the money, hoping he would have owners who would buy in. 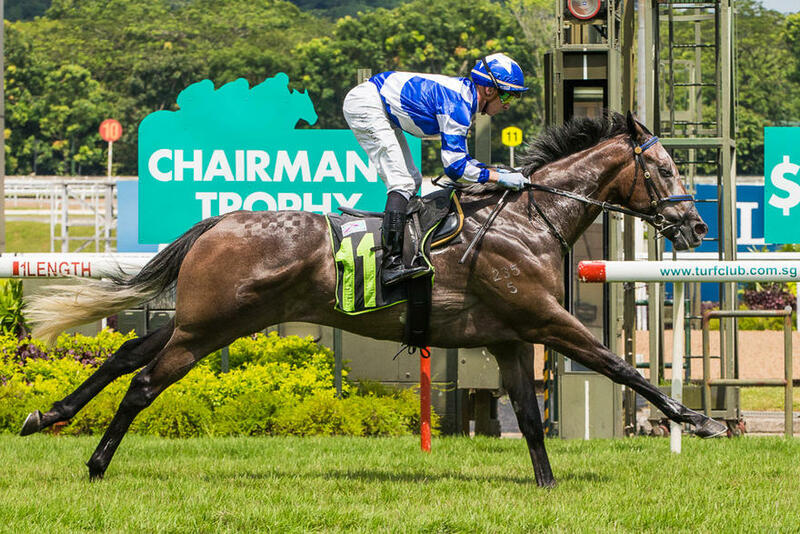 Along came two complete racing newbies, Michael Sturrock and Clarinda Tjia-Dharmadi, two lawyers who work in a Singapore law firm and who were friends with well-known Kranji racing identity, Paul Hickman of St George Stable. Gray had another three-year-old, a son of Smart Missile, looking for an owner, too. Keen to kickstart their new racing venture, the two legal eagles swooped down on both, naming them Runminderbinderrun and Runfinnrun under the Semper Anticus (latin for Always Forward) Stable. “We liked this horse (Runfinnrun) at the Ready-To-Run. After he was passed in, we went to the stud to enquire further,” said Gray. Gray’s wife Bridget wasn’t too sure about the yarn behind their unique monikers, but was certainly delighted they could run all right. “Michael is the one who names them. I’m not quite sure what it means but I’m sure their next horse will be some ‘Run-something-run’!” said Bridget. “Both Michael, who is American, and Clarinda travel a lot and couldn’t unfortunately be here today, but I’m sure they’ll be delighted with the good news. While Runminderbinderrun, their first-ever runner, has already shown some ability from his five starts - one second, one third and one fourth, Runfinnrun ($28) was simply smashing at his baptism of fire in Sunday’s $75,000 Stepitup 2015 Stakes, a Restricted Maiden Division 1 race over 1200m. Dropped in a rearward spot by jockey Daniel Moor as another debutant Kuda Bagus (Chin Chee Seng) dictated terms at a solid clip upfront, Runfinnrun had a fairly economical run before improving to a striking position as the field approached the home turn. Kuda Bagus showed plenty of cheek as Fight To Victory (Benny Woodworth) and Gamely (Vlad Duric) came throwing down the gauntlet at the 300m, but they were all left standing powerless when Runfinnrun shot past them towards a soft two-length win from Gamely. Fight To Victory took third place another nose away. The winning time was 1min 11.13secs for the 1200m on the Long Course. “He’s a lovely horse and he showed an impressive turn of foot,” said Gray. “I may look at the Three-Year-Old races for him. He’s going to get a mile and could be a Singapore Guineas (May 25) horse. The Australian jockey was at his second day back from a long enforced holiday for careless riding, and nothing beats the feeling of getting on the back of a promising sort at the first weekend back. “He’s a nice horse with good ability. He was a bit awkward early but he was good through the line,” said Moor. “He was well prepared, and if he shows the right attitude, he will win more races for sure.